Space-based laser offers a powerful pulse of energy to destroy missiles in flight. While space has been an excellent forum for peaceful exploration, it is also an excellent high ground from which to gain a military advantage. Spy satellites have been in use for decades. And in one form or another, as long as the Space Age has been around, various agencies have envisioned using space as a platform for missile launches or other activities. In this slide show, check out the top 10 space weapon concepts from over the years. (This slideshow was updated on Dec. 21, 2016). Missiles have actually been used for about 1,000 years, although Encyclopedia Britannica points out that there is no authoritative history of the first rockets. China is usually cited as the location where rockets first appeared, followed by Europe. Metal-cylinder rockets were first used in India in the 18th century, which sparked an English version from Sir William Congreve. Rockets were also used in a limited way in the Mexican-American War, the American Civil War and the First World War. Vast improvements in rocketry, however, began to show up in the military field in the Second World War. Both the Axis Powers and the Allies used missiles, but it was the German V-2 rocket that attracted the most attention, due to the more than 1,000 missiles that were fired at Britain. When Germany lost the war, several of the nation's rocket scientists were picked up by the Soviet Union and the United States. This helped improve rocket technology in both countries and spurred the space race between the superpowers. Missiles are, of course, still in use today, especially as intercontinental ballistic missiles (ICBMs, see future slides for more information). Enemies facing down a device that blasts streams of molten metal probably won't stand much of a chance. This idea, popularized in science fiction novels such as Arthur C. Clarke's "Earthlight" (1955), may become real someday thanks to the funding of the U.S. Defense Advanced Research Projects Agency (DARPA). The Magneto Hydrodynamic Explosive Munition (MAHEM) was announced in 2008. While no updates have occurred for quite some time, the page for MAHEM is still active on DARPA's website. The program promises "the potential for higher efficiency, greater control, and the ability to generate and accurately time multiple jets and fragments from a single charge," with what DARPA officials wrote is "lethality precision." MAHEM could possibly be deployed on rockets, the officials added. The Tactical High Energy Laser (THEL) program ran between 1996 and 2005, according to Northrop Grumman. THEL was created as a joint project between the United States and Israel. During that decade of development, the ground-based system destroyed 46 mortar rounds, rockets and artillery — all of which were airborne. While the program is no longer active, Northrop Grumman says the technology is now being reconstructed for the U.S. Army's Solid State Laser Testbed Experiment that, like THEL, will take place at White Sands Missile Range in New Mexico. With so many satellites orbiting the Earth, how hard would it be to outfit one with a weapon ready to fire at the Earth, or other satellites, as needs dictated? While such a concept would go against agreements such as the Outer Space Treaty, which bans weapons of mass destruction in orbit, a few military organizations have discussed it in recent years by. One famous U.S. project from the 1950s was Project Thor, which never got past the conceptual stage. Various concepts for space weapons over the years included "Rods from God," which would drop kinetic-energy weapons from orbit, as well as small satellites that would have onboard targeting systems allowing them to aim at other satellites or at the ground below. The Almaz space station was conceived in the 1960s, designed to make it easier for the Soviet Union to search for sea-based targets, according to Russian space expert Anatoly Zak, who runs the website Russian Space Web. It was believed that having humans in orbit would provide a powerful platform for orbital reconnaissance and allow the rapid changing of targets as battles evolved. The Soviet Union focused on the race to the moon in the 1960s, delaying the first deployment of Almaz until 1973. It was announced to the world as Salyut-2, the second Salyut space station, so as not to make others aware the Soviets had two space station projects, let alone a military one, Zak wrote. A failure in Salyut-2 prevented a crew from visiting, but the subsequent Almaz space stations Salyut-3 and Salyut-5 did have crews on board. (Salyut-4 never was sent to orbit.) The cosmonauts are reported to have performed surveillance on at least one mission, and to have fired a cannon in 1975, but technical problems with the stations prevented most missions from running for their scheduled lengths. The Manned Orbiting Laboratory (MOL) was a U.S. Air Force project that, despite never launching an astronaut, had an eventful life from 1963 to 1969 (the program's years of activity). Some of the milestones the project saw included selecting 17 astronauts, creating a launch site at California's Vandenberg Air Force Base and modifying the NASA Gemini spacecraft to accommodate the new program. One of the program's main objectives was reconnaissance, under a code name of Project Dorian. The camera system was intended to get photographs of the Soviet Union, among other hotspots, with a resolution better than any satellite of its time could have achieved. MOL also could have carried missiles (not nuclear, but something to cause a scare) and nets to nab enemy spacecraft. Many new details were unveiled in late 2015 with the release of more than 20,000 pages of MOL documents. The program was cancelled after estimated costs ballooned. (MOL was expected to cost more than $3 billion in dollars of the day, with $1.3 billion already spent, at the time of cancellation.) Some of the would-be MOL astronauts, such as Bob Crippen and Richard Truly, transferred to NASA for the first space shuttle flights. ICBMs (Intercontinental Ballistic Missiles) are land-based missiles that can fly more than 3,500 miles (5,600 kilometers), according to Encyclopedia Britannica. The Soviet Union sent aloft the first ICBM in 1958, and the U.S. first fired one in 1959, followed by a few other nations. Israel, India and China have recently developing ICBMs, and North Korea may be doing so as well. ICBMs can be navigated by computer or satellite and pinpointed to land on a particular city or, if sophisticated enough, a target within a city. While they are most famous for being able to carry nuclear weapons, they could also deliver chemical or biological weapons — although as far as people know, that potential has never been realized. The Soviet Union and United States agreed to reduce their ICBM stockpiles in 1991 as part of the Start I treaty, but Russia and the U.S. still have and test ICBMs today. After four missions in space, it's still not fully clear what the X-37B space plane is doing up there in orbit — but some people have speculated that the vehicle could be some sort of Air Force weapon. The reusable plane looks like a smaller version of NASA's space shuttle, but it is operated robotically and can stay in orbit for more than a year at a time. For its fourth (ongoing) mission, in 2015, the U.S. military confirmed a couple of the payloads — a NASA advanced materials investigation and an Air Force experimental propulsion system, for example — but most details about X-37B missions remain classified. An Air Force Tech Report video in 2015 had many ideas about what the plane could be doing up there, such as bombing from space, interfering with enemy satellites, performing reconnaissance or perhaps doing all of the above at the same time. But Air Force officials have always denied that the X-37B is a weapon, stressing that the spacecraft is testing out technologies for future spacecraft and carrying experiments to and from space. In 1985, an F-15A jet fired an anti-satellite missile at Solwind P78-1, a satellite that discovered several sun-grazing comets but was scheduled for decommissioning due to its instruments beginning to fail. Solwind P78-1 was destroyed with the Air-Launched Miniature Vehicle (ALMV) fired from the plane, but the test generated more than 250 pieces of space debris big enough to show up in tracking systems. Congress forbade further tests by the end of year, and the Air Force stopped the program in 1987. The successful test was part of a larger U.S. push at the time to find a way to destroy satellites without breaking the rules of treaties that banned nuclear weapons on spacecraft. Examples listed by the Union of Concerned Scientists included the Strategic Defense System (sometimes called "Star Wars") and the Air Force/Navy Mid-Infrared Advanced Chemical Laser that was designed to be fired from the ground. A test in 1997 appeared to overwhelm or damage the satellite sensor that was targeted. 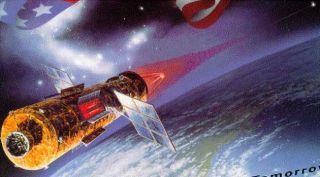 Later efforts included the kinetic-energy ASAT (which was cancelled) and the Counter Communications System, which used radio-jamming capabilities. Anti-satellite systems have also been investigated by the Soviet Union, China and India, among others. For example, a famous 2007 anti-satellite test by China generated a huge cloud of space junk. In 2013, a shard of the destroyed satellite hit a Russian satellite and destroyed that, too. Scientists know that asteroids are the ultimate killers. After all, a 6-mile-wide (10 km) space rock is believed to have wiped out the dinosaurs roughly 66 million years ago. Audiences have seen the potential human impacts in movies such as "Meteor"(1979), "Deep Impact"(1998) and "Armageddon"(1998). And even relatively small asteroids can have a big impact, thanks to the tremendous speeds at which space objects travel. For example, scientists think the object that exploded over the Russian city of Chelyabinsk in February 2013, generating a shock wave that shattered thousands of windows and wounded 1,200 people (as a result of the flying glass shards), was just 66 feet (20 meters) wide. But manipulating an asteroid is in the realm of science fiction, for now. NASA does have a proposed asteroid mission on the books; initially, the agency proposed moving a small asteroid close to Earth for scientific investigation, but elected to pluck a boulder off an asteroid instead. This Asteroid Redirect Mission is currently scheduled to launch in the early 2020s. Even though some experts say asteroids are "lousy weapons," because they're only useable once every few hundred years, science fiction has you covered there as well. Aliens wipe out Buenos Aires with an asteroid in the 1997 film "Starship Troopers," for example. Space rocks have even wiped out Martians in books such as "Protector" (1973), by Larry Niven.